AS part of New Wave Marine’s ongoing growth and development the company have taken delivery of two new strategic vehicles, said Darren Negus, operations manager at New Wave Marine. Mr Negus, said: “These two new vehicles will enable the company to better serve our customers and add major value to the services we provide across the UK and in Europe,” he said. ADR Artic Barrel Combination Tanker, that can deliver fuel and takeaway sewerage and holds over 27,000 litres. 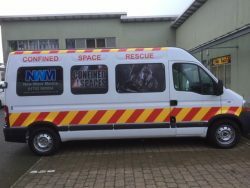 New Confined Space Rescue Vehicle to support Rescue Unit team. New Wave Marine launched last year our International Confined Space Rescue Unit which is on-call 24/7 ready to enter all manner of hostile environments and save people’s lives across the UK and Europe. New Wave Marine (NWM) – which specialises in industrial cleaning and works on Plymouth’s incinerator, student flats, and even superyachts – now has a team of eight highly-trained professionals ready to save and retrieve casualties from confined spaces such as underground vaults, storage silos and storage tanks. © 2019 Copyright New Wave Marine.